Life is seldom easy or straightforward in Macondo, the small town at the centre of Gabriel García Márquez’s renowned One Hundred Years of Solitude. The first half of the book alone is full of violence, treachery, and deception; things only get worse in the second half. And the Buendía family who are the town’s lifeblood have a particularly complex set of tales to tell: at times over-run with children (legitimate, adopted, or otherwise), at times riven by strife and haunted by ghosts, and forever fragmented by the ambitions or desires of their menfolk. Throughout, it is the matriarch, Ursula Iguarán, who tries to keep things together and look after the house, but there is only so much that even she can do. The Buendías seldom seem to learn from their mistakes–indeed, they delight in repetition–and so it is with some bitterness and desperation that Ursula exclaims, as she sees her grandson going through the same motions as his grandfather: “I know all of this by heart, [. . .] It’s as if time had turned around and we were back at the beginning” (303 ). The irony is that both men’s folly is the dream of progress and development; there’s little that’s more unoriginal and hackneyed than novelty. But it’s hard to blame the Buendías, even the crassest and least self-reflective among them. For they are often at best only inadvertent agents: their most heartfelt goals seldom come to fruition; Colonel Aureliano Buendía, for instance, leads constants rebellions and revolts, to little obvious effect. And on the other hand, the characters are often no more than vectors for energies that come from elsewhere. Sometimes these are broad, historical forces: so Colonel Aureliano, then, is more a personification of the endless warfare that afflicted Latin America in the nineteenth-century–an incarnation of a restless war machine–than he is the agent of his own destiny. But sometimes these energies are more local and more specific, the expression of non-human actants that surround and permeate Macondo. For famously this is a book that opens with the declaration that “Things have a life of their own, [. . .] It’s simply a matter of waking up their souls” (84 [1-2]). And it is this that is the essence of García Márquez’s magical realism: the acknowledgement that objects, too, have their own lives, their own desires and destinies that can both compete and collude with human plans and expectations. The scene is set in the opening pages, as the gypsies bring everything from magnets and telescopes to flying carpets and ice to the remote backwater of Macondo. Some of these things are, of course, more “magical” than others, but the point is that they are all treated (more or less) equally, as examples of mechanisms and apparatuses that both expand and frustrate human desire. 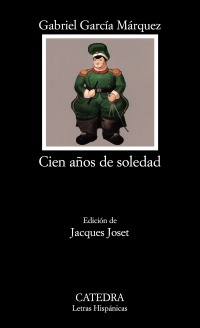 Caught up in the whirlwind of novelty, Ursula’s husband, José Arcadio, happily installs an alchemist’s laboratory in his own home, and it is this space–that becomes laboratory, workshop, and archive–that is the hub of the book’s fictive universe, however much for long periods it is forgotten, sealed up, and ignored. For the liveliness of things continues whether or not we realize or acknowledge it. And collectively, house, town, and family are no doubt best understood as an assemblage or set of assemblages that variously channel, filter, reproduce, transform, and magnify broader social forces through the intermediation of a complex multitude of smaller parts (buildings, rooms, people, body parts, animals, objects) whose interaction is frustratingly predictable at times and utterly novel at others. There are many similar fables: of violinists with a shared circulatory system (in Judith Jarvis Thomson’s argument for abortion), of children drowning in a pond (in Peter Singer’s case for charity), and so on. But this is a long tradition, and not restricted to ethical dilemmas. Think, for instance, of Rousseau’s Emile, which is essentially a book-length philosophical parable. Or of Plato’s Republic with the “Ring of Gyges” and, most famously of all, the “Allegory of the Cave.” Indeed, Plato’s dialogues as a whole are in some ways as much literary as philosophical–certainly more literary than the tale of the fat boy, though in all these cases narrative and the imagination and invoked for the services of reason and argumentation. In fact, there are few thinkers, however rigorous, who do not find themselves indulging in some such artifice not only to embellish but also to undergird the tenets of their philosophical systems. Even Spinoza has, say, the man who “because he does not believe that he can by wholesome food sustain his body for ever, should wish to cram himself with poisons and deadly fare.” And Wittgenstein has his ladder, however much he urges it needs to be thrown away once his propositions are finally understood. 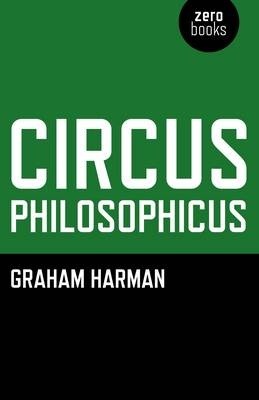 So when Graham Harman is said to be trying, in Circus Philosophicus, “to restore myth to its central place in the discipline” or to be resurrecting “the long-abandoned style of Platonic myth” (77), I’m not quite so convinced that myth has ever really gone away. Nor, on the other hand, is it obvious to me that what Harman offers in this short book are “myths” at all. Myths, after all, imply some kind of collective belief–and it is in the name of revealing the presuppositions of such beliefs that myth-making has rather gone out of fashion in theoretical circles, and understandably so. (Think only of Roland Barthes’s Mythologies as one of the founding texts of what we might call cultural studies, or one of the points at which French Theory and cultural studies most nearly intersect.) Harman’s myths are designed rather to explicate his own, rather particular, beliefs about the world around us. It is better then to see the six brief vignettes that he offers us simply as stories, parables intended to shed unfamiliar light on familiar topics. The fact that he resorts so unabashedly to literary forms to advance his agenda is neither novel nor all that exceptional. But it does allow us to evaluate these short texts as stories as much as for their philosophical content. Or to ponder the relation between form and content here. What’s striking is a certain flatness or affectlessness, even when the matter narrated by Harman’s stories is otherwise full of drama or pathos. Take the way in which death is treated, for instance. This short book is surprisingly saturated by death, but at the same time remarkably free of mourning. Sometimes this is understandable enough: when, as in “The Bridge,” we are asked to imagine a series of pre-Socratic philosophers being thrown by devils one by one into a molten lake, it is clear that it is really ideas that are being dispensed with, not people. It is at best cartoon violence when, for instance, Pythagoras is dispatched: “The demons drag the geometer to the edge of the lake. They add a final insulting touch by scrawling numbers on his cloak, both integers and his hated irrationals, before pushing his soul into the void” (23). Still, here the philosophers’ demise is at least the point of the story. Elsewhere, death is a little more unexpected and inexplicable. “Offshore Drilling Rig,” for example, is a story that takes Harman and the novelist China Miéville to a rig in the Gulf of Mexico. Their chaperones are (unbeknownst to them) killed in a helicopter accident, leaving Harman and Miéville to debate the nature of being as a hurricane passes through. The fate of the oilworkers, however, is here unlamented; if anything, the accident is the condition of possibility for the conversation it enables, though presumably it could have been enabled by means other than a ditched helicopter that kills off “a blunt but sensitive name of Jonas” (41), among others. The oddest death is the one that Harman inflicts in “The Haunted Boat.” This story is in fact misnamed: it is less about a haunted boat than a haunting one, concerning as it does a ghost boat rumoured to plough the Sea of Japan. By means of a comparison between the actual ferry, which he takes between Hiroshima and Matsuyama, and the parallel one that haunts it, Harman illustrates his “fourfold” conception of objects in terms of time, space, essence, and eidos (62). But Harman’s ferry is haunted not only by its imagined double, but also by the ghost of the fellow traveller who first tells him the story of a mysterious second vehicle: “a pleasant native of Osaka, roughly [Harman’s] own age, who said that his name was Kenji” (54). Later, we are told in rather desultory manner that “Kenji is now dead (or so I read recently on his suspended Facebook page” (55). Again, however, no mourning or other affect ensues: Harman merely tells us that “reports of Kenji’s death have only heightened [his] interest in the [haunted/haunting] vessel” (55). In short, this is the strangest kind of ghost story, in that it seems almost oblivious to the question of life and death except in that death poses the practical problem (against the whole ghost story genre) of cutting off access to the living, of now precluding rather than enabling conversation. The affectlessness of Harman’s stories is, moreover, frequently combined with notably mannered stylization. Consider the treatment of love or romantic relationships in “The Bridge,” which is framed as a conversation between Harman and his fiancée. But it is written in the voice of a rather repressed minor man of eighteenth-century letters: “My Olympia, this image may seem only obliquely related to our disagreement. But you know me well, and can guess the trend of my thinking” (17). This odd mannered and half-strangled voice is also presented as Harman’s elsewhere: in “Offshore Drilling Rig,” he tells Miéville “Your thoughts are known to me” (47), for instance, rather than the more obvious twentieth- or twenty-first-century idiom, “I know what you’re thinking.” And when we discover that Harman’s fiancée breaks off their engagement, though this is presented as an outcome of philosophical or even religious differences, one feels one’s sympathy tending towards a woman who would have otherwise to endure a man who describes his “jovial bonhomie and backslapping ways” leading to his being “lionized by jaded scions of the East” (13, 14). Frankly, he sounds insufferable. Now, none of this need reflect on the philosophy itself. There are very few philosophical tales that can make much claim to literary value. Besides, there are perhaps some who enjoy these strange hybrids of travel writing with a dash of steampunk and a side of one of Jane Austen’s country parsons. And yet Harman seems to think that they should delight as well as instruct: with his first story’s concluding image of the cosmos as “a vast series of interlocking ferris wheels” he says “Let these trillions of wheels spin in your mind. Let them sink into your heart and enliven your mood” (12). Well, they may have that effect on some. But me, if I want my mood enlivened, I’ll look elsewhere than this stilted fictional universe, this dull circus whose equanimity towards death is symptom of an entrenched and pervasive absence of life.